Lynn Maalouf, deputy director of research at Amnesty International Middle East and North Africa, speaks during an interview in Beirut, Lebanon, Feb. 6, 2017. Amnesty International says Syrian authorities killed at least 13,000 people in mass hangings at a prison north of Damascus. Amnesty International says the Syrian government has executed thousands of prisoners in what it considers war crimes and crimes against humanity. In a report published on Tuesday, Amnesty International said that between 5,000 and 13,000 prisoners were executed from September 2011 to December 2015. Once or twice a week, groups of up to 50 people at a time were hanged at the Saydnaya Prison, Amnesty said. They would be beaten, then hanged in the middle of the night, it said. 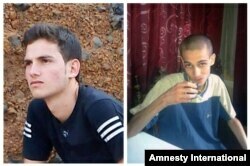 Amnesty said it has no reason to believe the Syrian government has halted the executions. It said most of the victims were civilians believed to oppose the government of President Bashar al-Assad. They included doctors, lawyers, activists, engineers and humanitarian workers, the rights group said. The report took a year to complete. It is based on statements from 84 witnesses, including former Saydnaya guards and prison officials, detainees, judges, lawyers and experts on detention in Syria. This is Amnesty’s second report on the prison. The killings are carried out with little or no respect for the law, according to Lynn Maalouf, Amnesty’s Deputy Director of Research. She spoke in Beirut, Lebanon on Monday. Maalouf said the executions take place after a “sham” trial that lasts only “a minute or three minutes.” She said they are approved by the “highest levels of authority,” including the minister of defense. The report calls on the United Nations Security Council to demand that Syria permit an independent investigation of the executions at Saydnaya. It said the government should let independent investigators visit all places of detention. Amnesty said on Tuesday it asked the Syrian government to comment on claims made in the report, but received no response. In the past, the government has denied reports of massacres documented by international rights groups. In addition to the hangings, the Amnesty report said, prison inmates are regularly tortured through severe beatings and sexual violence. “They are denied adequate food, water, medicine, medical care and sanitation, which has led to the rampant spread of infection and disease,” it said. They also say many detainees develop serious mental disorders. In other news, the United Nations confirmed that Syrian peace talks will restart later this month in Geneva, Switzerland. Talks between the warring sides were delayed until the 20th [of February] to give a ceasefire time to succeed. Syria’s six-year-long civil war has killed hundreds of thousands of people and wounded many more. Jamie Dettmer wrote this story for VOA News. Anne Ball wrote this story for Learning English with material from Reuters and VOA. George Grow was the editor. We want to hear from you. Write to us in the Comments Section and visit us on our Facebook page. sanitation – n. the process of keeping places free from dirt, infection, disease, etc., by removing waste, trash and garbage, by cleaning streets, etc.